We live in a world that is known, every corner thoroughly explored. But has this knowledge cost us the ability to wonder? Wonder, Caspar Henderson argues, is at its most supremely valuable in just such a world because it reaffirms our humanity and gives us hope for the future. That’s the power of wonder, and that’s what we should aim to cultivate in our lives. But what are the wonders of the modern world? Henderson’s brilliant exploration borrows from the form of one of the oldest and most widely known sources of wonder: maps. Large, detailed mappae mundi invited people in medieval Europe to vividly imagine places and possibilities they had never seen before: manticores with the head of a man, the body of a lion, and the stinging tail of a scorpion; tribes of one-eyed men who fought griffins for diamonds; and fearsome Scythian warriors who drank the blood of their enemies from their skulls. As outlandish as these maps and the stories that went with them sound to us today, Henderson argues that our views of the world today are sometimes no less incomplete or misleading. Scientists are only beginning to map the human brain, for example, revealing it as vastly more complex than any computer we can conceive. Our current understanding of physical reality is woefully incomplete. 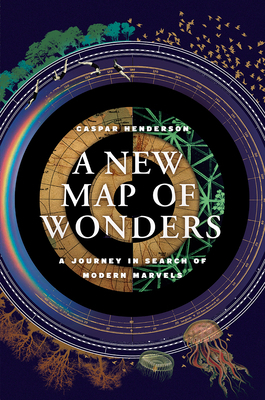 A New Map of Wonders explores these and other realms of the wonderful, in different times and cultures and in the present day, taking readers from Aboriginal Australian landscapes to sacred sites in Great Britain, all the while keeping sight questions such as the cognitive basis of wonder and the relationship between wonder and science. Beautifully illustrated and written with wit and moral complexity, this sequel to The Book of Barely Imagined Beings is a fascinating account of the power of wonder and an unforgettable meditation on its importance to our future. Caspar Henderson is the author of The Book of Barely Imagined Beings, which won the Royal Society of Jerwood Award and the Roger Deakin Award of the Society of Authors, and was short-listed for the Royal Society Winton Prize. He lives in Oxford, UK. “Part celebration and part meditation, an elegant study of things that should awe and amaze us—and why we are capable of awe and amazement in the first place. . . . In this treatise, Henderson (The Book of Barely Imagined Beings), who admits to “no qualifications beyond curiosity and stubbornness,” advances many points that ought to give us all pause. . . . As enjoyable as the text are the marginal notes, peppered with quotations on all sorts of matters from great thinkers across the ages. . . . A wonderful book and just the thing for cogitators." "Henderson mines the cosmos for wondrous phenomena, from light to transformative technologies. We veer from Saturn’s moon Enceladus—spraying water into space through cracks in its ice sheath—to the human embryo, which at eighteen days resembles 'a tiny jam sandwich.' Strung through Henderson’s virtuosic meditations on such marvels is an exploration of felt wonder." "A New Map of Wonders reprises an argument that was a stimulus for The Book of Barely Imagined Beings: an ability to see beyond the human, whether towards other species or deep space, will be critical to our survival through the Anthropocene." "This book does exactly what it says on the cover, and shows us where wonder is to be found. His account of familiar phenomena shows how unfamiliar and extraordinary they really are."